If you are a passionate cyclist and have an old road bike at home, the Bergkönig cycling event is an experience not to miss. You are also welcome to just have some fun! This season we are calling all creative artists under 12 to participate in our new drawing competition. And the top prize is a royal treat for the whole family. Are you looking for a real adventure or do you just want to soak up the sun and countryside on a wonderful stroll? Whatever your preferences, you will find the perfect route in our new guide. The mountains are just too good a backdrop not to make the most of the wonderfully small and winding roads. Therefore, we have set up various rallies to take part in. Our hair is a distinguishing feature of our appearance. To help you take excellent care of yours, we have included a whole new hair care line by Sisley. Find out more at our Spa. In March we hosted a whole film crew. The reason: part of a new movie was shot in Gstaad. We have used the occasion to gather together all movies shot here. SHAPED HERE, IN AWE OF THE FORCE OF NATURE YET DRIVEN TO MASTER ITS MYSTERIES THROUGH THE COMPLEX MECHANICS OF THEIR CRAFT. STILL TODAY THIS PIONEERING SPIRIT INSPIRES US TO CONSTANTLY CHALLENGE THE CONVENTIONS OF FINE WATCHMAKING. es, Gstaad is truly paradise on earth. That’s a fact. The winters are still what you expect of the season: with snow, blue skies and great skiing conditions. And as soon as summer comes around, the Alps transform into a sunny wonderland, into the perfect place to be: a great countryside, mountains with their summits still snowed in, creeks and brooks. The ideal temperature – warm, but not overly hot. Of course, I can’t predict the weather conditions, but generally speaking, we are rather lucky up here. You will appreciate the Gstaad Palace’s excellent location when you take a dip in one of the numerous lakes during a spectacular hike. A hike with views you will remember even if you don’t take a picture with your mobile phone. I truly believe that these are the best memories. couple of minutes – and that is definitely worth seeing! If you don’t yet have a favourite place, perhaps one of our tours in our new hiking guide Nature will lead you there. 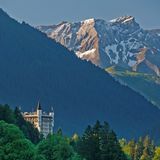 Read more about the tours available in and around Gstaad on page 14 and 15. However, there are many other wonderful things to do in the Alps during summer as well. To give you a few ideas, we outlined A day in Gstaad for you on page 13. Feel free to follow the ideas or just pick the recommendation which suits you best; we are sure you will enjoy yourself a lot. And you can always be sure of one thing: whatever you decide to do, we at the Palace are there for you whenever you require help. You have a certain wish? All you need to do is to talk to our approachable staff or me in person and we will make your stay a truly unforgettable experience which you will long remember even without photographs. Enjoy your read – I’m looking forward to seeing you at the Gstaad Palace. The organisers didn’t know whether taking vintage cycling to the Alps would work, especially given the gear transmission ratio of many classic bikes, with some boasting a lowest ratio of 42 × 22. But 2017 was a resounding success, giving the participants a real taste of the glory days of cycling and a serious sporting challenge. The Big Round consists of 103 km of riding and 2,400 metres of going vertical. Less ambitious cyclists and owners of fragile bicycles can take gentler routes. Alex Beeler is the main organiser of the first Swiss vintage cycling event. We had some questions for him. What gave you the idea to set up such an event? In Europe and worldwide, vintage bicycle races are giving those who love old road bikes a chance to meet, compete and share great moments with their peers. It was only a matter of time before such an event took place in Switzerland. The idea has been passed back and forth in the scene … and it was me who got it off the ground. The location is what sets it apart from all the other vintage bike events – the Alps. It’s really unique and we have had great support from the region of Gstaad, tourism organisations and industry alike. The Palace is a very important partner – and the Bergkönig hands their crown to the hotel. Are you a cyclist yourself? I’m a collector of bikes … and yes, I love cycling. But I prefer the relaxed, fun route when I take a ride, so I’m definitely not a competitive cyclist. Nevertheless, prior to the event last year, I went the long route and it took me approximately seven hours to complete. Send the coloured painting to the Palace or hand it in yourself at the reception to enter the contest. Enjoy precious moments with your kids f you know the Gstaad Palace as a family place from previous visits, you already know one thing: you and your children are more than welcome! We have come up with some fabulous ideas, and, of course, a colourful programme of activities. For this summer season, we would like to introduce a special treat. Read more about that in the article below. The Palace Gstaad gives the abbreviation VIP a whole new meaning: very important princess or prince. A kid’s dream does not have to remain a dream. We will create an atmosphere appropriate for one princess or prince. All children up to the age of 12 can take part in the competition. •	A childminding service with handpicked carers is available on request. •	Our outdoor swimming pool is supervised by a lifeguard, this allows you to relax in the sun without worrying. •	During the summer season, a giant bouncy castle, the perfect replica of the Gstaad Palace, is inflated in the hotel gardens on Sundays. So, while the parents are enjoying an extended brunch, the youngsters can expend their excess energy. For local guests • CHF 2,100 per child for one week. For hotel guests • CHF 2,360 per child up to the age of 12 staying in a room with their parents. • CHF 2,960 per child aged between 12 and 16 years staying in a room with their parents. • CHF 780 per adult and per week for the parents’ tennis clinic. Double room rates start at CHF 4,950 per room for 6 nights, including half board. Coffee and a croissant (or two) with an incredible view of the Alps – tastes twice as good as normal. If you start your day at the Palace on your balcony this way, a smile on your face is inevitable. Time to get down and do some sport! Have you ever tried stand-up paddling before? No? Then go ahead and give it a go: this easy-to-learn trend sport gives you a whole new perspective of your ­surroundings. Get to know this great way of moving around on the water. Or maybe you’d rather stay ashore and do some fishing? It’s up to you! After such an exciting, amazing and arduous day, a relaxing massage is exactly what you will crave. And yes, we can rejuvenate you with a wonderful treatment which bolsters your energy and relaxes your muscles. And since everybody has different needs, we have a selection of massages to choose from. Palace Picnic Fresh air, the activities and all that moving around definitely call for a picnic. There is no better place to enjoy an outdoor meal than at Lake Arnen. All you have to do is make yourself comfortable and enjoy the various delicacies the Palace has prepared for you: finger food, dessert, fruit and wine will be delivered by the Palace. Älperzmorge, real cheese and milking cows After you have hiked a good two hours, a real Swiss breakfast (Älperzmorge) with typical dishes from the region, most of them homemade and organic, is a great idea. This is exactly what you will find at the cheese dairy Vorderes Eggli. If you’d like to, you can milk a cow during the subsequent tour of the stables. And it goes without saying that you will learn all there is to know about cheese. Paper cutting course at the hotel Ever wondered about how those remark­ able paper cuttings are made? Not anymore! Back at the hotel, Ueli Hauswirth will teach how to do it. Test your own skills: you will create your own piece of art to take home and show off. Or maybe the master will make a silhouette of you? This is much more than just a delicious dinner – it’s time to combine two of your senses in an unforgettable way. You will enjoy your meal against the backdrop of the breath-taking Alpine panorama. Your taste buds will explode, and the sight of the mountains will leave a lasting impression. Bring your day to a close A wonderful day needs a wonderful evening: now it’s time to while away the nightfall hours in cosy togetherness or on your own. Relish these precious moments which are so scarce in life and unwind in the beautiful atmosphere of the Palace. Hiking in nature laces only become great if you know your way around. Wherever you go or hike there is always the difference between “satisfactory” routes and awesome trails, breath-taking panoramas, gripping climbs or just wonderful countryside strolls. We want to introduce you to the latter. Browse the varied trails and decide which is for you. Allow yourself to be inspired by the pictures, calculate the level of activity you would like and read the corresponding description. Places to rest and get local snacks, activities en route, sights which are worth looking for and, of course, a detailed map that will help you to find the best option for you to discover the Saanenland. Guests frequently ask us for hiking routes. Families are keen on walks which are compatible with a stroller and a playground on the way to have a break. Others are looking for extraordinary adventure – challenging climbing courses, crossing a glacier, going up with a helicopter to delight in a splendid dinner with just the most incredible view. Whatever you are looking for, around Gstaad there are many different options to spend time outdoors. Whether you climb up to the Walig Hut and spend a night there, take a gondola to the Rinderberg and do a highaltitude hike, let a mail car take you to Lauenen and walk back to Gstaad, or you have a helicopter take you to the top of Glacier 3000 to eat lunch and then cross the glacier – the choices are numerous. So, get your copy soon to find out which is the perfect hike for you. The publication is available for free when you check in to the hotel. If you need further assistance or a personal recommendation, we are more than happy to assist you. Inspiration is one of the main ideas which drove us to make a collection of the trails. We have put in our own experience, asked established mountain guides and taken the wishes of our guests into consideration. The result of our en­­dea­vours is Nature: A durable hard-cover brochure which fits in every backpack or bigger purse and presents unforgettable routes for every taste and skill. Gstaad has become famous for its rallies, in large part because of Andrea Scherz: he is a great fan of motors himself and enjoys taking part in challenging rallies. This year’s friendly competitions take place on the following dates: •	29 June to 1 July: Weekend-desVétérans Gstaad •	31 August to 2 September: Gstaad Palace-Challenge You have missed your opportunity to register? Then take your chances and apply for next year’s car events. very day, our hair endures a lot of procedures which are nothing but stressful and damaging. Now we offer treatment products to alleviate these issues. Formulated with high concentrations of powerful plantbased active ingredients, Hair Rituel by Sisley products act on both the scalp and the hair follicle as well as the whole length of the hair to provide extensive allround treatment. Our spa staff will advise you on the ideal product(s) for your hair – so go ahead, stand up for your hair to bring out its true inner beauty! Our hair not only shapes our looks and is a great expression of our personality but also represents how well we (can) take care of it. Let’s have a look at a typical day for your hair: in the early morning, you are under pressure, so you quickly wash your hair. Naturally, without conditioner as there is no time. And since you are running late, you decide to blow-dry your hair on the hottest setting rather than letting it dry naturally. On the way to the office, there is a freezing wind – which is not at all good for your hair. The air-conditioned atmosphere of your workplace does not help either. And after work, you decide to go to the sauna – do we need to say anything about the heat? We have added yet another type of massage to the range of treatments we offer our guests: the traditional Thai massage. This full body therapy consists of assisted yoga-­ type stretches as well as elongating movements, joint mobilisation and pressure point massages. Our masseurs use rhythmic pressure to work on ten specific energy lines. For the massage, we will provide you with comfortable clothes which you wear during the therapy. You lie on a futon on the floor while the masseur works on your muscles and loosens the tension in them. The style of the Thai massage room is in keeping with the rest of the Spa – with one difference: the futon on the floor. So, let us help you unwind and become mobile and flexible again. We have now included a line in our Spa shop which cleans, regenerates, fortifies and enhances your mane. 90 years of timeless cool o your laps and improve your technique, or relax and listen to the sweet splashes of water: our Olympic-sized outdoor pool is the perfect place to have fun in the summer sun. Built in 1928, its history is as rich as it is refreshing. “Through ingenious use of the terrain and magnificent alignment, its engineer has succeeded in creating an ideal facility, which is unparalleled in terms of location and design,” ends the fervent review from 1928. Today, nearly 100 years later, we more than agree: thanks to its timeless design, the pool has lost none of its charm, while providing our guests with countless summer pleasures in the most beautiful surroundings. “Even the most blasé visitor cannot resist a feeling of admiration at the sight of this artful work, created as if by magic …”: with these words, the local newspaper proudly introduced the newly built pool to the public on 25 July, 1928. Artful it was (and still is) indeed, this masterpiece of swimming pool design created by Beda Hefti, a renowned engineer and pioneer of technologi­ cally advanced spa architecture. Savour the sun or jump from a five-metre platform, train your elite swimming skills or immerse yourself in cool summer bliss: our luxurious outdoor swimming area has a lot to offer. The 50-metre pool was a joint venture of Gstaad’s hoteliers, requested by Palace director Wilhelm Michel. The Palace provided the terrain, the Hotelier Association took care of construction and operations. The project was completed surprisingly quickly; a rather unpleasant surprise was the bill that followed: due to an engineer’s calculation error and subsequent project changes, the amount was almost twice as high as planned. Luckily, it was the roaring twenties: tourism boomed, and their economic success, together with a sense of pride in the new pool, got the hoteliers over the shock of the nasty bill very quickly. •	Olympic-sized 50-metre pool •	Paddling pool •	1- and 3-metre diving boards, 5-metre diving platform •	Table tennis •	Restaurant •	Bath towel hire Open daily from 9.30 am to 7 pm, if the weather is fine. The pool is open to the public. Yes, there are movie stars as guests and sometimes there are movie stars here for work. But many people would not know that even Indian actors have been to the Palace to shoot their films. So, scenes for three big Bollywood productions were actually shot at this very Swiss hotel between 1991 and 2000. Gran Fondo Prestige Gstaad Palace Come up, slow down: The luxurious once in a lifetime experience for cyclists in the heart of Gstaad. A century of iconic photos from foreign films that use Switzerland as a backdrop. Photos, posters, film excerpts, selfie corner and more! Free admission. PERRIER-JOUËT, THE ALLURING CHAMPAGNE Since its foundation in 1811, the champagne house Perrier-Jouët has crafted elegant, floral wines of rare finesse with a Chardonnay hallmark. The elegance of the cuvees echoes that of the Art Nouveau anemones adorning the Belle Epoque bottle and offers moments of pure delight and beauty. Gstaad Palace with us and let us know about your adventures in the surrounding countryside. The most popular post at #gstaadpalace or #inlovewithgstaadpalace will win an overnight stay in one of our double deluxe rooms, including half board and complimentary access to the Palace Spa. The Palace family welcomes you this summer from 23 June to 9 September 2018 and in winter from 21 December 2018 to 10 March 2019. Designed by Charles Blunier & Co. Ltd., illustrations by Daniele Costa, printed by Müller Marketing & Druck AG in Gstaad. Picture Credits: Gstaad Palace und Gstaad Saanenland Tourismus. No parts of this publication may be reproduced without prior approval of Gstaad Palace. All rights reserved. Copyright 2018 by Gstaad Palace.